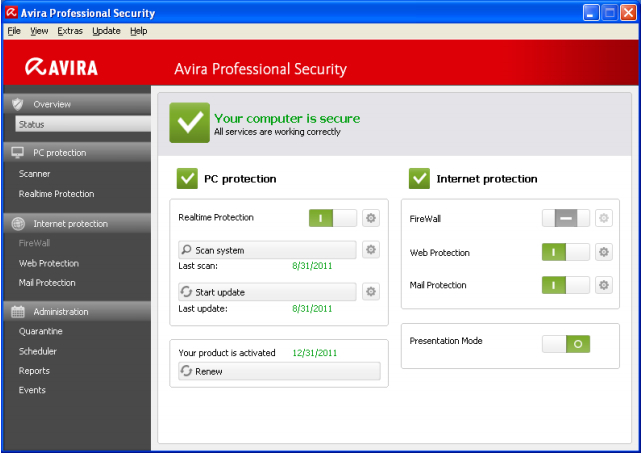 Avira Professional Security 2013 13.0.0.2890 - Download Win Apps. Virus protection for Windows PCs – secure and efficient. From individual systems to PCs in a network: Avira Professional Security will reliably protect your computers from virus and hacker attacks while using as few resources as possible. At the same time, the program can be administered extremely efficiently via the Avira Security Management Center. Protection includes mail and web traffic protection, quarantine management and a firewall.